Should You Draft a Tight End Before a Wide Receiver in Your Fantasy Draft? A few weeks ago, I wrote about how fantasy football scores of quarterbacks have been rising the last six years. This led to the conclusion that you should draft an elite QB early in your draft. But, much like how you need to carefully consider all aspects of a process during a Six Sigma project, we now have to consider everything else that the quarterbacks can affect. Specifically, wide receivers and tight ends. After all, if QBs are throwing for more yards and touchdowns, somebody has to be catching those passes and getting more fantasy points. 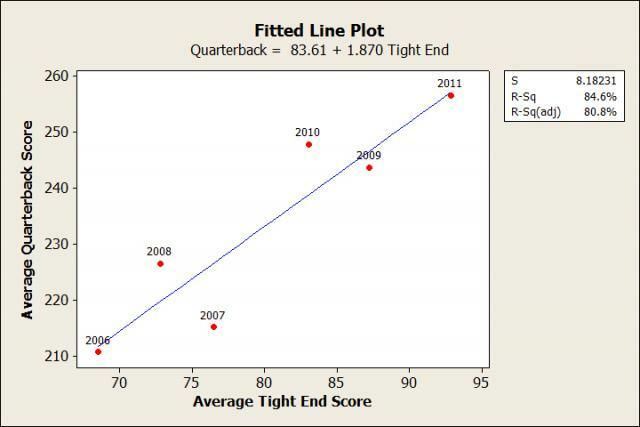 Let’s use data and statistical software to see what conclusions we can draw about wide receivers and tight ends. I took the 25 top-scoring wide receivers from 2011 and compared their total number of fantasy points to players from the previous 5 seasons with the same rank. For example, Calvin Johnson led all WRs with 226 fantasy points last year. The WRs that led the league in fantasy points the previous 5 years (Bowe, Johnson, Fitzgerald, Moss, and Harrison) scored an average of 204.8 points. So Johnson scored 21.2 more points than the average #1 ranked wide receiver. NOTE: All data comes from KFFL.com and does not include any games in week 17 or the NFL playoffs. Get the data here. There is obviously no trend to see here. Those extra yards and touchdowns aren’t going to the elite wide receivers. Quarterbacks are getting their extra points by spreading the ball around. So are they spreading it around to tight ends? Let’s find out! In all of the fantasy football articles I’ve written, one message continues to come through again and again: Don’t draft a wide receiver early. We’ve seen before that you’re not gaining that many points by taking a top receiver as opposed to taking an average one later in the draft. 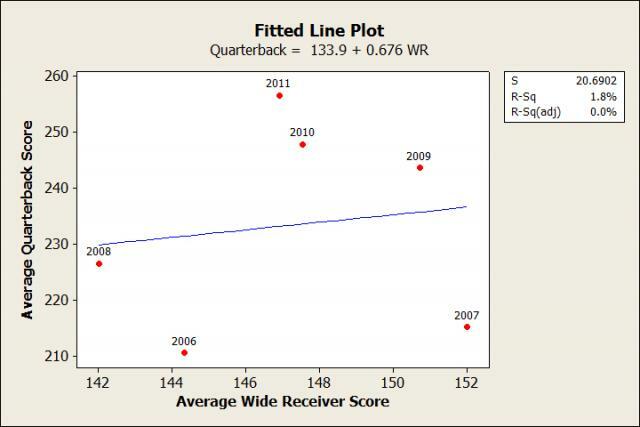 And this data analysis further shows that the improved quarterback play isn’t benefiting the top wide receivers at all. Quarterbacks are spreading the ball around more to their second and third receivers and the tight ends. 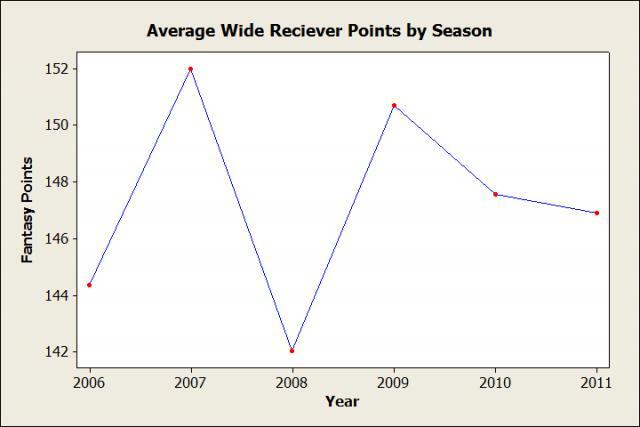 And as these positions continue to get more fantasy points, the value of an elite receiver is lessened even more. I would definitely take a tight end before a WR (excpet for Johnson) in the draft this year. Speaking of tight ends, let’s talk about the impact Jimmy Graham and Rob Gronkowski have had on the NFL. Both players scored more points than any other tight end in the past 6 years (and probably ever). 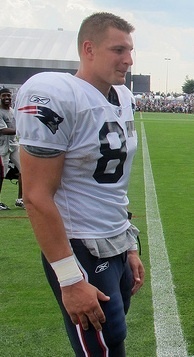 NFL coaches everywhere saw the success New Orleans and New England had using their tight ends. And the NFL is a copycat league. I wouldn’t be surprised at all to see more coaches integrate the tight end into their game plans more. So not only would I try to grab a top tight end early (I have Graham in all of my leagues), it might not be bad to grab another in a double digit round (I’ve been taking Jared Cook). 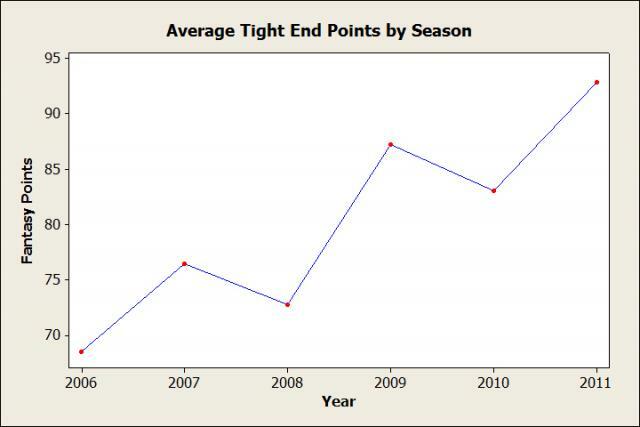 If tight ends keep getting emphasized more, it could pay off greatly. For example, last year I drafted Finley in the 4th round, and Gronkowski in the 13th. By week 8, I had traded Finley for a RB I badly needed, and started Gronkowski each week. With tight ends on the rise, it’s worth the chance of taking a flier on a late round tight end. You never know when you might end up with the “Next Gronk”. Photograph by WBUR. Licensed under Creative Commons Attribution 2.0.